Successfully Added 2.5 Inch LCD Monitor - CCTV Testing Kit to your Shopping Cart. 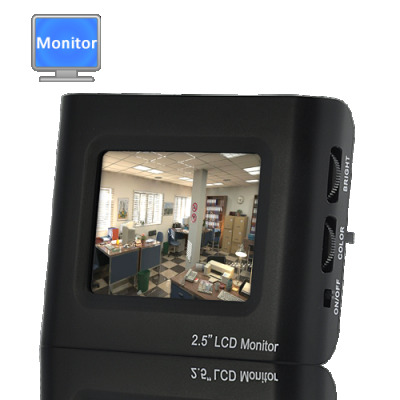 2.5 inch LCD monitor for CCTV camera installation and testing! When you need a way to instantly check for video performance, view angle, and focus of a security camera, this LCD monitor is it! You can now test all CCTV cameras with this portable 2.5 inch LCD monitor that is specifically designed for testing video feeds and video quality when installing CCTV cameras. This 2.5" TFT LCD monitor is small and lightweight enough that you can carry it everywhere for instant video display. To make life even easier, this LCD Monitor comes with a portable carrying arm/wrist strap, so that both your hands are free while you're up the ladder doing what you do best. If you're a technician, then this is the perfect gadget for you and is designed to make your work life wire-free and worry-free. By displaying real-time video on its display, this CCTV testing monitor can help you to set up a CCTV camera or identify/troubleshoot CCTV system problems. It is powered by an internal 1000 mAh rechargeable battery that assures 3 hours of constant use - more than enough time to get that camera angle right. This 2.5 Inch LCD monitor is brought to you at a wholesale price that can't be beat. Click "Add to Cart" now and we will express ship you a sample straight away. Brought to you by Chinavasion, the leader in CCTV security cameras and testing gadgets. on 2013-03-02 18:04:29 Great product, even better service! This monitor is great, it has allowed me to set up all of my external cameras with ease. This was my first time buying from chinavasion but I am completely satisfied with the delivery time and the regular update available when tracking your product during processing and shipping.